Arching stands of red alder (Alnus rubra) beckon at the loop trail’s beginning and end. Mount Muller Loop, May 16, 2014. Although the site of much human activity in the early to mid-1900s, including logging, mining, and a slash fire escaped from the valley below, Mount Muller continues the gradual recovery of its woody, many-layered mantle. The mountain’s thirteen-mile/21.00-km loop trail arcs through varying habitats, from the lush, leafy woodland at its feet, the fine weft of slender, maple-laced conifers stretching up its flanks, to the blooming meadows, stunted forests, and distinctive stone outcrops strung along the cloud-swept peaks of its coxcomb ridge before descending again through similar strata to the trailhead where it began. Whether hiked clockwise or counterclockwise, the trail climbs steeply up one end of the mountain and, even after attaining the ridge, repeatedly loses and regains elevation along its undulating crest before dropping as sharply down the other end. Throughout, posted signs confer whimsical monikers on various points, e.g., Miners Crossing, Nosebag Point, Crow Caw Flats, etc. When the clouds that frequently gather on the mountaintop permit, its ridgeline meadows afford views down the Sol Duc River Valley below and on to snowy Mount Olympus and even Mt. Baker to the extreme northeast. This profile follows the loop trail clockwise, as suggested by signage at the trailhead. Although encounters with others on the trail are infrequent, it is a multi-use trail open to hikers, mountain bikers, and equestrians alike. Around the trail’s many bends and hillocks, bikers may be heard before seen; if curiously swift voices approach from beyond sight, be sure to move aside so that all users can coexist without mishap. Littleton Creek chatters softly near the trailhead before continuing on its own path. 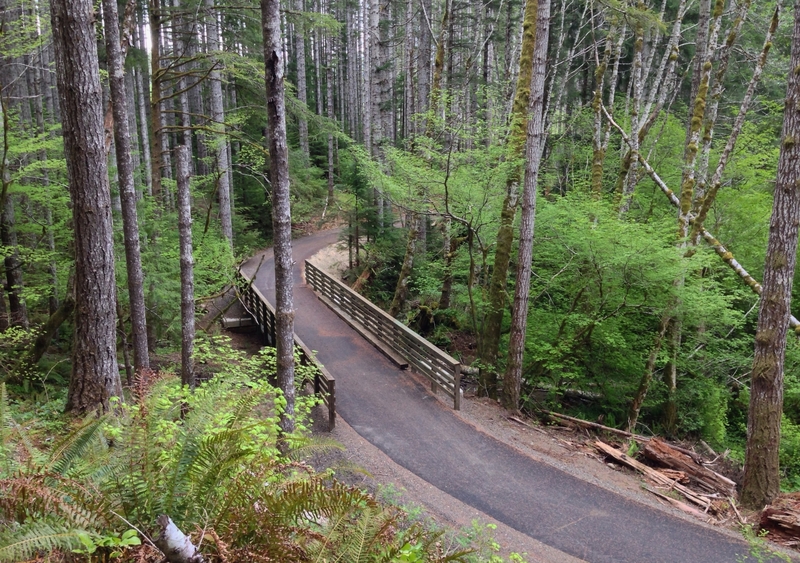 Mount Muller Loop, May 16, 2014. As the trail climbs the mountain’s drier slopes, the forest quickly shifts to coniferous hemlock (Tsuga sp.) and fir (Abies sp. ), clearly second-growth trees from their uniform size and dense distribution, but beginning to resemble a more mature woodland with a healthy understory carpeting the floor and a middlestory of smaller trees developing among the slender, unbranched columns that support the overarching canopy. Mount Muller Loop, May 16, 2014. As the mountain’s new forest matures and naturally thins itself to its tallest, strongest trees, sunlight diffusing through the rising canopy supports an assortment of woodland blooms on the dappled floor below. Clockwise from top left, the clustered blooms of the Cascade Oregon-grape (Berberis nervosa a.k.a. Mahonia nervosa) resemble stalks of tiny daffodils; evergreen, or, redwood violets (Viola sempervirens) wink into the sunlight above; Lyall’s, or, little mountain anemones (Anemone lyallii) pioneer otherwise barren patches of forest floor; western fairy slippers (Calypso bulbosa var. occidentalis) rear distinctively coifed heads; and Smith’s fairy bells, or, fairy lanterns (Prosartes smithii) dangle throughout the leafy lowland understory. Mount Muller Loop, May 16, 2014 and April 19, 2015. The star of Mount Muller’s spring woodland floral display is the Pacific trillium (Trillium ovatum), cleverly named for its triplicate structure and resemblance to its distant lily relatives. Although its classic white form is reminiscent of its Easter lily cousin, the Pacific trillium often blushes to varying shades of shell pink to nearly amethyst as it ages after pollination, which appears a more common trait to those inhabiting the northern Olympic Peninsula than elsewhere. Mount Muller Loop, April 19, 2015 and May 16, 2014. Just over three miles/4.80 km from the trailhead, the trail reaches the ridgeline and curves eastward, alternating between rolling meadows with increasingly sweeping views and close forest dwarfed by the harsh conditions of higher altitude. 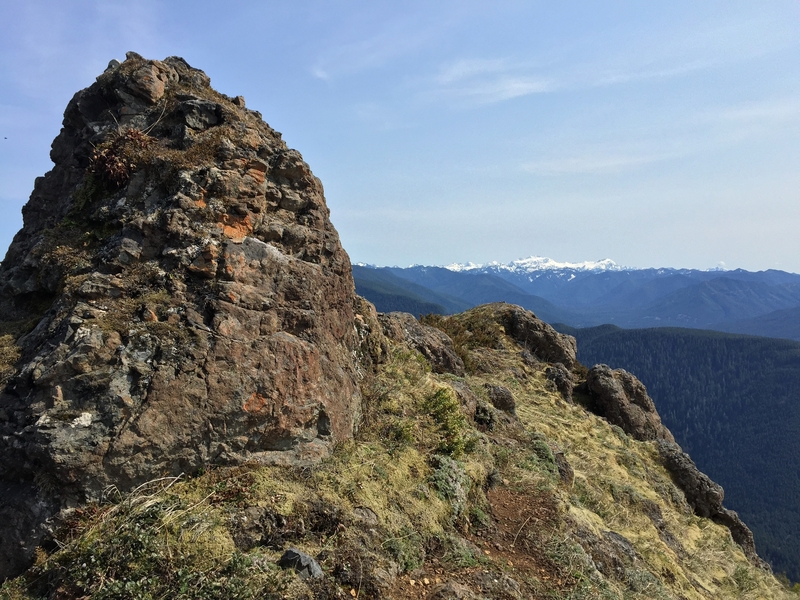 From Jim’s Junction on Mount Muller’s western crest, the Snider Ridge Trail connects to the North Point and Kloshe Nanitch approximately three miles/4.80 km westward. Mount Muller Loop, May 16, 2014. As the trail progresses eastward, the ridgetop meadows afford increasingly expansive views of the Sol Duc River Valley below and the Olympic Mountains beyond. Posted signs name each meadow, most after Forest Service workers who made the trail, e.g., Jasmine, Allison, Milsap, and Markham. Mount Muller Loop, May 16, 2014. On the mountain’s open, upland slopes, wave-tipped mats of common juniper (Juniperus communis) direct the gaze to distant points beyond. Mount Muller Loop, May 16, 2014. Mount Muller’s sky-topped meadows produce an array of robust spring and summer blooms that flourish in the abundant sunlight, including, clockwise from top left, the many-monikered blueleaf, Virginia, wild, or common strawberry (Fragaria virginiana), which is an ancestor of all domestic strawberries; dandelions (Taraxacum sp. ); Pacific bleeding hearts (Dicentra formosa); kinnikinnick (Arctostaphylos uva-ursi); and harsh paintbrushes (Castilleja hispida). Mount Muller Loop, May 16, 2014. At Mount Muller’s higher elevations where recovery from past clear-cut logging takes place more slowly, the teeming second-growth forest has yet to finish thinning itself to the open, lushly layered state that has developed farther down the mountain. Few sunbeams pierce the stilly gloom and the forest floor is littered with debris and bereft of most other life. Mount Muller Loop, May 16, 2014. At approximately 5.0 miles/8.00 km from the trailhead, a short side trail leads up to Mount Muller’s summit. Set into the forest, the summit provides a well-framed view of Mount Olympus sitting on the southeastern horizon. Mount Muller Loop, April 19, 2015. The summit hosts a small colony of yellow avalanche-lilies (Erythronium grandiflorum) amid drifts of what is likely a species of the aptly named snow lichen (Stereocaulon sp.). Mount Muller Loop, May 16, 2014. Just beyond the side trail to the summit, another side trail leads from the main loop to Panorama Point, which offers the most expansive vistas of the trail, including, again, a direct view of Mount Olympus. Mount Muller Loop, April 19, 2015. From Panorama Point and the increasingly rocky slopes eastward, the view soars across Lake Crescent and on to Mount Olympus. Mount Muller Loop, April 19, 2015. On a clear day, Mt. Baker (in this photo, what appears to be a small cloud on the horizon) can be spied away northeast across the Salish Sea. Mount Muller Loop, April 19, 2015. Many blooms cling to the transitional marches where open meadows merge with the mountain’s upper woodlands. In spring, look for white avalanche-lilies (Erythronium montanum) in flights beside the trail (top left), huckleberries’ (Vaccinium sp.) confection-tinted blooms adorning contrasting twigs (top right), “red”-flowering currants (Ribes sanguineum) dangling in fuchsia hues not as truly red as their scientific and common names imply (lower left), salmonberries (Rubus spectabilis) compensating for the disappointingly bland taste and appearance of their fruit (which resembles clusters of salmon eggs) with exotic-looking blossoms (lower center), and Utah honeysuckle (Lonicera utahensis), more commonly distributed in the Rockies than in the Cascades or Olympics, nevertheless making an appearance on Mount Muller (lower right). Mount Muller Loop, May 16, 2014. Even when they obscure the mountain’s panoramic vistas, the clouds that frequently sweep its slopes create their own surrealistic atmosphere. Mount Muller Loop, May 16, 2014. Massive, lantern-jawed ogres repose petrified beside the trail. Mount Muller Loop, May 16, 2014. Even where stones dominate the mountainscape, look for life in niches here and there. On the left, spreading phlox (Phlox diffusa) brightens a meandering mosaic of mosses, lichens, and kinnikinnick (Arctostaphylos uva-ursi). On the top right, broadleaf stonecrop, or, Pacific sedum (Sedum spathulifolium), a succulent known for its particolored leaves, clings to the side of a rocky outcrop. On the lower right, Cascade desert-parsley (Lomatium martindalei) garnishing the pebbled trailside displays a family resemblance to its distantly related dinner plate cousin. Mount Muller Loop, May 16, 2014. Lichens thrive on the mountain’s rockery. On the left, a robust badge of lungwort (Lobaria pulmonaria), papery and grey in the absence of moisture, ruffles a rocky nook. On the right, devil’s matchsticks (Pilophorus acicularis) whisker a trailside stone. Mount Muller Loop, April 19, 2015. Dropping down the mountain’s eastern slope, the trail leaves behind the bristling ridgetop forest and reenters the the lower woodland’s finely columned comb. Mount Muller Loop, April 19, 2015. Vine maples (Acer circinatum) weave a delicately arching middlestory throughout the maturing forest tapestry. Mount Muller Loop, May 16, 2014. Throughout the spring, summer, and autumn, pale forms of the fly agaric mushroom (Amanita muscaria) emerge from the moist woodland floor. Here, a dapper specimen sports a plume-like sprig of moss upon its cap. Mount Muller Loop, May 16, 2014. Approximately 8.00 miles/12.80 km from the trailhead, a short side trail leads to another notable stone feature: Fouts Rock House, a naturally occurring stone lean-to formed by two garage-sized boulders. Mount Muller Loop, April 19, 2015. From inside Fouts Rock House, the view out the entrance illustrates its ample capacity to harbor not only two- but likely four-legged creatures on occasion. Mount Muller Loop, April 19, 2015. At approximately 9.00 miles/14.50 km from the trailhead, the trail drops abruptly to a paved private drive, which it follows briefly westward before diverging on its final leg. At the road, do not cross the bridge, but turn right and proceed for approximately a quarter mile/0.40 km. Mount Muller Loop, May 16, 2014. The trail tracks the road for approximately a quarter mile/0.40 km before resuming its earthen path through bowers of vine maple (Acer circinatum) at Crow Caw Flats. Signage is sparse, but keep a wary eye for the trail leading right from the road. The remaining three miles/4.80 km of the trail are level and often within earshot of Highway 101’s whir. Mount Muller Loop, May 16, 2014. Ending where it began, the trail again enters the gently bowed alder (Alnus rubra) forest at the hem of the mountain’s woodland mantle. Mount Muller Loop, April 19, 2015.